Hemorrhaging (bleeding) in the fins and eye of a freshwater drum believed to be infected with the VHS virus.The fish was collected from Little Lake Butte des Morts. Image courtesy Wisconsin Department of Natural Resources. Updated map: Lake Winnebago in eastern Wisconsin at Oshkosh, Lake Michigan, Lake St. Clair at Warren, Lake Erie and Lake Ontario (all highlighted with red in above map) have had metric tons of fresh water fish die from lethal viral hemorrhagic septicemia in 2005 through 2006; first die-offs of 2007 have now been reported to USGS. Authorities are trying to keep the virus from spreading to the other Great Lakes and into the Mississippi River (red underlined lower left) that extends south to New Orleans. 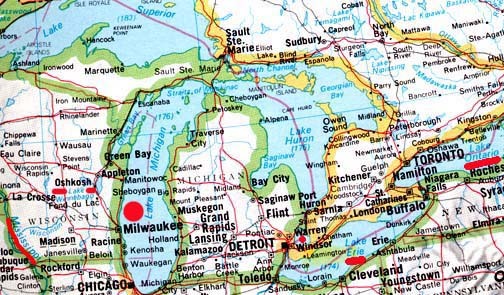 May 29, 2007 Madison, Wisconsin - The Wisconsin Department of Natural Resources reported on May 24, 2007, that a brown trout that died in Lake Michigan and washed ashore near the Kewaunee/ Algoma area preliminarily tested positive for viral hemorrhagic septicemia, or VHS. The University of Wisconsin-Madison Wisconsin Veterinary Diagnostic Laboratory conducted the preliminary test on the Lake Michigan trout. The sample has been sent to an Ames, Iowa, lab to confirm the VHS findings.The deadly fish disease also spread earlier this month to Lake Winnebago fish in eastern Wisconsin.